I decided to start the year of right with homemade pizza, not something I do very often. So over the New Year weekend I made about 12 pizza's. The photo above is the highlights. The guest list for these events is short and very exclusive. The waiting list on the other hand is quite long. Not to be a braggart, but I'm pretty good at making pizza. Salami (two kinds locally made and sliced by me). Pepperoni (again sliced by me). 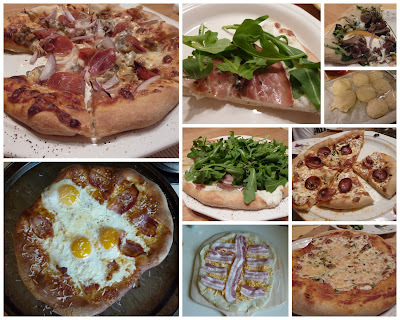 One of the pizza's that stands out was the olive oil, fresh mozzarella, prosciutto and arugula (top center of photo). Of course the bacon, egg, cheese and olive oil was also excellent. If you can get on the guest list, it's worth what ever it may cost.